With the large influx of new displays into the market boasting '3D support', we thought we would produce an article which outlines some of the key technologies being used, where they differ and how they work. We will look at the two main techniques being used today, those being active shutter and passive polarization technologies. We will also discuss the trends in desktop displays from a 3D point of view as well as looking at the other aspects being developed to support 3D, such as panel technology. To begin with an explanation, a modern 3D display / monitor is capable of conveying a stereoscopic perception of 3D depth to the viewer. The basic requirement is to present offset images that are displayed separately to the left and right eye. Both of these 2D offset images are then combined in the brain to give the perception of 3D depth. Although the term "3D" is ubiquitously used, it is important to note that the presentation of dual 2D images is distinctly different from displaying an image in 3 full dimensions. The most notable difference is that the observer is lacking any freedom of head movement and freedom to increase information about the 3-dimensional objects being displayed. Holographic displays do not have this limitation, so the term "3D display" fits accurately for such technology. In modern displays the term 3D is actually an overstatement of capability and is referring to dual 2D images as being "3D". The accurate term "stereoscopic" is more cumbersome than the common misnomer "3D", which has been entrenched after many decades of unquestioned misuse. Based on the principles of stereopsis, described by Sir Charles Wheatstone in the 1830's, stereoscopic technology provides a different image to the viewer's left and right eyes. Examples of this technology include anaglyph images and polarized glasses. Stereoscopic technologies generally involve special spectacles. It is generally expected that most consumers have the desire to migrate to 3D systems from 2D. It is predicted that the 3D market will grow tremendously as soon as the problems in the existing products are eliminated and the issues on basic infrastructure, such as price competitiveness and 3D content, will be resolved. It is highly likely that the content industry will also make a fast transition into 3D in all areas such as TV, film, and game and have already begun to make this change. Passive Stereo 3D - special films are applied to the screen instead to produce the 3D effect, and polarized glasses separate the images for the left and right eye. This is the standard solution for delivering stereo 3D to audiences of more than a small group of people and is becoming increasingly popular in desktop displays as well. Autostereoscopic 3D - means that no glasses are required. However, they are also prohibitively expensive at the moment and have often been delayed due to the slower up-take of stereoscopic screens in general. In this article we will try not to dwell on the "which is best" discussion as the whole 3D concept is still relatively new. We will instead focus on the technologies and how they work, and as part of this provide some of the information and claims from the manufacturers which support their specific technology. The generation of left and right images (‘image pairs’) is the key first step in experiencing Stereo 3D. Broadly speaking, there are two approaches to generating the image pairs. Native Stereo 3D is the generation by an application (either 3D rendering, or video playback of Stereo 3D content), while Stereo 3D conversion is the creation, using additional software, of stereo image pairs using a monoscopic source (again, 3D rendering or video). Applications that are not written to natively support Stereo 3D can deliver stereo image pairs via the use of stereo conversion software. This approach is typically used for games and conversion of mono video to stereo, but is not typical for professional graphics applications; applications that benefit from Stereo 3D typically implement the native approach outlined above. Once Stereo 3D image pairs have been created by the source, they have to be prepared for the stereo display device that is being used by the user and transmitted to that display over a display interface in a format that the display can interpret and use. Dual-link DVI, HDMI 1.4a and DisplayPort all have the ability to transmit stereo images although in some cases the resolution is limited. Where active shutter glasses are being used, a synchronization signal for these is also generated and transmitted. Active, frame sequential, display with shutter glasses - As discussed earlier, the display presents left and right eyes in sequence and shutter glasses are synchronized with that display. Passive (polarizing) display and polarized glasses - As discussed earlier, the use of polarizing or wavelength-filtering glasses exist. Passive displays come in a few forms. Some passive displays are created using dual display technology. To achieve this, two displays present images with different polarization, and they are typically aligned with a half-mirror that permits the light from both displays to be presented together to the user’s eyes. This approach allows for full brightness and full resolution stereo to be presented to the user. Far more common is the single display method. Here typically a polarizing filter or film is added to the front glass of a display, carefully aligned to rows or columns of pixels (or some checkerboard pattern). Left and right images of a stereo pair are aligned to the corresponding pixels. This approach is attractive because of the lower cost of the display (than dual display). A great deal of innovation has been taking place in Stereo 3D display technologies, leading to a fairly complex set of options for driving these displays, and a need for the user to understand the display type and select the corresponding preparation and transmission method. With the increasing popularity of Stereo 3D content for consumers (e.g. Blu-ray 3D, transmission to the home from various cable and satellite providers), display interfaces have been evolving. This is particularly important as we understand the question of how now-dominant Liquid Crystal Displays (LCD) can work with Stereo 3D. HDMI 1.4a and DisplayPort now support transmission of Stereo 3D frames and offer ‘plug and play’ support for Stereo3D via communication of device capabilities and standard Stereo 3D transmission formats. A key point about these transmission approaches is that the matching-up of appropriate glasses (including synchronization of active shutter glasses, where appropriate) is driven by the displays supporting the standards, rather than directly by the GPU or system generating Stereo 3D content. This will further simplify Stereo 3D solutions by taking out the requirement of an understanding by the user of exactly which glasses to use with a given display type. We already see this with the availability of stereo glasses (active and passive) from the vendors of consumer TV sets, all of which support the HDMI 1.4a standard. One point of note, however, is that the current HDMI infrastructure, including the cables in use and most devices today, supports limited bandwidth. 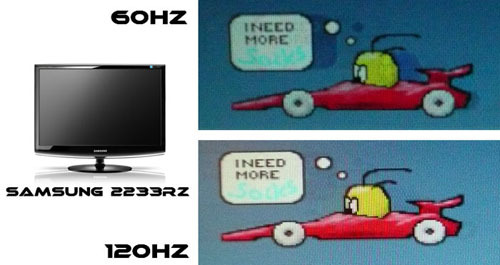 This means that 120Hz Stereo 3D can be achieved only up to 720p resolution. In order to support 1080p resolutions, the frame rate is limited to 48Hz, or 24Hz Stereo 3D. This refresh rate is suitable for film content playback (e.g. Blu-Ray 3D), the bandwidth required for 120Hz stereo (devices today support 48Hz stereo – corresponding to 24Hz Stereo for standard movie playback). However, because of this limitation you would perhaps not want to use a screen (including LCD TV's) with HDMI 1.4a for 3D gaming since you would be limited to 720p resolution maximum at 120Hz. Instead if you want full 1080p support for 3D gaming you would need to consider a 120Hz capable desktop monitor with a suitable interface which will carry the higher bandwidth. DisplayPort (particularly v1.2), with its significantly higher bandwidth does support 120Hz Stereo 3D, and displays supporting Stereo 3D over DisplayPort are now available. This is AMD's preferred method of connectivity for their HD3D enabled displays. On other desktop displays, including those supporting NVIDIA's 3D vision, Dual-link DVI is used to allow the support of content up to 1920 x 1080 @ 120Hz although this is not standardised. This is fine for connection of PC graphics cards to drive 3D content, but of course is of no use for connecting external devices to the display. You would need to think about the availability of DisplayPort of HDMI 1.4a if you want to view 3D content from a non-PC device. 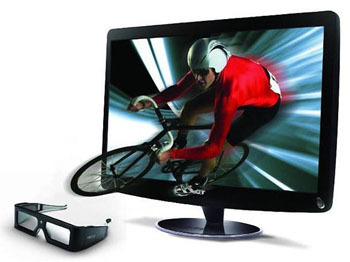 The first main stream method to reach the desktop LCD monitor market for delivering 3D content was active shutter technology using shutter glasses (SG). This is also sometimes referred to as time division switching. This 3D method is referred to as "active" since its glasses have an active role in the production of the 3D effect. It requires the use of liquid crystal shutter glasses (also called LC shutter glasses or active shutter glasses) to function. The special shutter glasses are used in conjunction with a certain type of 3D enabled display, graphics card and software package to create the illusion of a three dimensional image, an example of stereoscopy. Each eye's glass contains a liquid crystal layer which has the property of becoming dark when voltage is applied, being otherwise transparent. The glasses are controlled by a special transmitter connected to the display / PC that sends a timing signal that allows the glasses to alternately darken over one eye, and then the other, in synchronization with the refresh rate of the screen. Meanwhile, the display alternately displays different perspectives for each eye, using a technique called alternate-frame sequencing, which achieves the desired effect of each eye seeing only the image intended for it. So in simple terms, the glasses open and close at a very fast speed (60 times per second) and alternate between the right and left eye so that the image being viewed is only seen by one eye at a time. The synchronization of the glasses to the sequential left and right eye frames is typically accomplished using a VESA-standard 3-pin stereo connector on a GPU that connects either directly to the glasses or to an emitter that wirelessly communicates to the glasses. SG technology has been widely used by many manufacturers and strongly promoted by NVIDIA who pioneered their "3D vision technology" for desktop LCD displays. AMD also offer a similar method using SG technology, and Samsung, Sony and Panasonic are key players in the LCD TV market and back the active shutter technology as their preferred method of delivering 3D to consumers. However, there is no industry standard defined at present which means each vendors methods (and glasses) may only work with a small set of compatible devices, and not when paired with other vendors equipment. While standardization is underway, it is important to bear this in mind when considering the purchase of a Stereo 3D solution that uses active shutter methods. Historically, active Stereo 3D evolved in a world dominated by Cathode Ray Tube (CRT) displays. A typical refresh rate of 120Hz was chosen, corresponding to 60Hz of images to each eye. This stems from a need to ensure that with CRT displays, flicker caused by the fading of pixels (inherent in CRT technology) was not noticeable. Since the shutter glasses are actively switching between each eye at a high frequency, you are only receiving half of the refresh rate / frame rate of the screen per eye. A normal LCD monitor would operate at 60Hz refresh rate and so that would actually provide very low refresh rates per eye if it was halved to 30Hz each. This would introduce a noticeable flicker and would not be usable on the most part. For SG technology on desktop LCD monitors there is a requirement for the screen to support a higher refresh rate of 120Hz which then matches the requirements previously outlined for older generation CRT displays. This is a true support of 120Hz input frequencies which has not been available in the past. This in turn can allow 60Hz per eye and a far higher frame rate is possible. Not only will this allow you to use 3D content using SG methods, but it can also have uses in 2D gaming and applications. Since the screens can support a 120Hz input frequency, you can achieve double the frame rate of a traditional 60Hz screen which is important for people intending to run competitive or high end games on their display. It also helps improve perceived motion on an LCD screen, and will commonly help show smoother moving images. It has also been shown to help reduce artefacts and issues sometimes associated with overdrive technologies used to boost liquid crystal response times. When the screen is run at a higher refresh rate, associated dark or pale trails caused by overly aggressive or poorly control overdrive impulses can be reduced or removed. See our Samsung SM2233RZ review for instance and the example shown above. You will see that the dark overshoot is eliminated when the screen is run in 120Hz mode since the frames are refreshed more often (twice as fast in fact). So the active shutter method in the desktop monitor market has one big advantage in that it can support 120Hz refresh rates, bringing benefits to 2D content as well as offering the all-important 3D SG support. 2) High Resolution and "Full HD 3D"
Active shutter methods are often promoted as being "full HD 3D" and able to support 1080p resolution properly. In fact manufacturers backing this method often then refer to a supposed resolution limitation of passive technologies such as FPR which we will talk about later. In the case of SG methods, the full 1920 x 1080 resolution (of a 1080p image) is transmitted to each eye, although keep in mind that the shutter glasses mean that you are only ever seeing this through one eye at a time in reality. As already explained, SG technology is reliant on active shutter glasses which are actively producing the 3D effect when in use. There are many different manufacturers of these glasses in the market including large LCD TV manufacturers like Sony and Samsung. The active shutter glasses are often criticised for being heavy, bulky and very expensive. Because they are technologically advanced, they are more expensive (by a considerable amount) than passive 3D glasses such as those used in FPR methods. Keep in mind also that they are not always supplied with a monitor or TV and so purchasing them separately can become expensive, especially for multiple users. They are quite heavy because of their in-built technology and the fact that they must be battery powered. This also means the glasses have to be charged from time to time. All in all they are generally quite bulky and heavy so not ideal sadly. More of an issue with the 3DVision shutter-glasses is the fact that they only really work best in certain conditions. Ideally you want to play your games and view your 3D content with all nearby lights turned off and in darkened room conditions. Light from other sources including other screens, keyboards, artificial lights etc have a refresh frequency of their own and can introduce an unwanted "strobe" affect when combined with the refreshing of the active shutter glasses. There are also potential issues with compatibility of these glasses between vendors and between different screens. In March 2011 Panasonic Corporation, together with XPAND 3D, have formulated the M-3DI Standard, which aims to provide industry-wide compatibility and standardisation of LC (Active) Shutter Glasses. This movement aims to bring about compatibility among manufacturers of 3D TV, computer, notebook, home projection, and cinema with standardised LC (Active) Shutter Glasses that will work across all 3D hardware seamlessly. It seems not to be gaining much traction however. In the desktop LCD monitor arena, NVIDIA are a big player through their "3D Vision" kit. There have been a couple of versions to date including wired and wireless glasses. 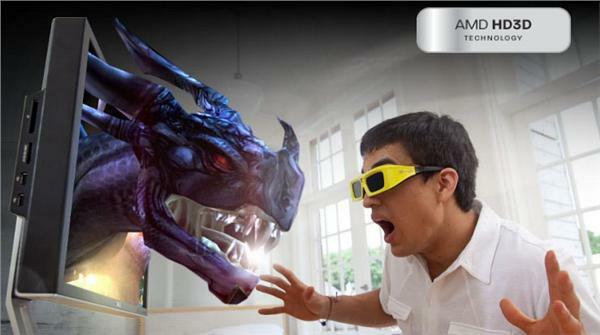 The latest version of their glasses is the NVIDIA 3D Vision Glasses 2. These come with a variety of enhancement features and technology and packaged in the form of better design. 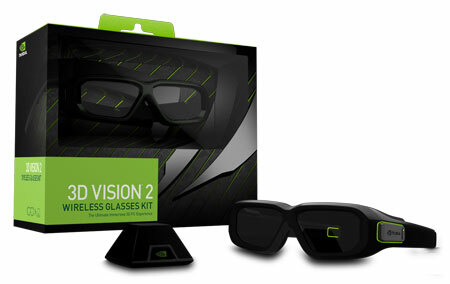 NVIDIA 3D Vision 2 comes 20 percent larger and are made using materials that are lighter and flexible. So, the problem of eye fatigue that is often felt by gamers due to the use of 3D glasses for a long time can now be reduced somewhat. Since the time for the shutter to open and close is so short, crosstalk can occur, which is an overlapping of the image of one side with the image of the other side (which is not supposed to be seen). To minimize this effect, a black image is inserted between the left/right images, or the backlight is temporarily turned off. This is why SG type 3D images flicker unnaturally and can sometimes look artificial. Since the very operation of active shutter glasses requires the lenses to be switched continually on and off in sync with the displays refresh rate, some degree of flicker is introduced. Since the glasses are normally used in conjunction with high refresh rates (120Hz) the flicking of the lenses on and off is not visible as such. However, over time the flickering can lead to eye fatigue or sometimes dizziness and headaches. This flickering has really been one of the main issues with active shutter methods, and is also one of the key reasons why other manufacturers have switched instead to passive 3D solutions. Heavy and bulky active shutter glasses can also become uncomfortable and tiring over even short periods of time. One issue which has caused some concern for SG methods is the brightness of the image seen by the user. The active shutter glasses have a tint to them already and the brightness of the image is reduced noticeably when viewing 3D instead of 2D content. Some measures have been taken to help improve this area. In the desktop display market NVIDIA 3D LightBoost is a technology implemented in the monitor or notebook panel and works by controlling the panel backlight to only turn on when the LCD screen contains a ghost free-image. Since that is a short period of time, the NVIDIA GPU can turn the backlight on with higher energy which results in increasing 3D brightness. Older NVIDIA 3D Vision glasses can be used with these improved LightBoost compatible displays as well, although not to the full extent of the benefits of using the latest generation of NVIDIA Vision Glasses 2. It also works when connecting to the screen using HDMI 1.4 3D and so content from external Blu-ray players and PlayStation 3's for instance will also benefit. Look out for monitors certified as supporting NVIDIA Lightboost. Polarized or passive 3D technology operates quite differently to active shutter (SG) techniques. Unlike SG techniques, the 3D effect is actually created by the screen or projected image and not by the glasses and so it is sometimes considered a more 'true' 3D technique. It is a "passive" technology since the glasses are not active in creating the 3D content and instead handle the polarization of the image being shown. It is the technology that's typically used by cinemas to show modern 3D films like Avatar or Harry Potter in 3D. In a projection system, such as that at a cinema, two images are projected onto the screen, and each image is polarized in a different direction. You wear polarized glasses with lenses that are polarized in opposite directions, each lens matching the polarization of its corresponding image. The polarized lens covering your left eye is polarized to block the right image, and the polarized lens covering your right eye is polarized to block the left image. So your left eye can only see the left image, and your right eye can only see the right image. Showing two images with different polarizations is a little trickier on a flat-screen TV however and requires the addition of a special film which polarizes the image and splits what your right and left eye see when combined with the polarized glasses. These filter light to ensure that the correct eye sees the correct left or right image. The main manufacturer who seem to be backing passive 3D methods for monitors and TV's is LG, and they are promoting their FPR, or 'Film-type Patterned Retarder" technology to give it its full name. 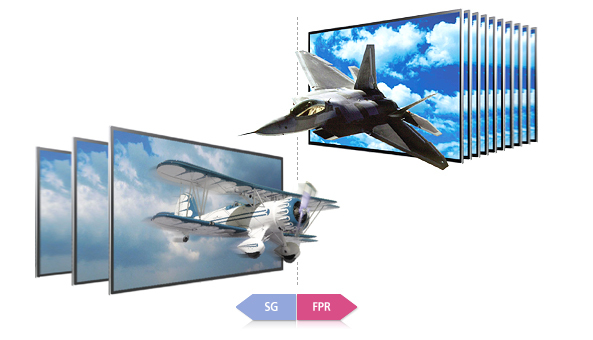 FPR is a technology which is being heavily developed by LG.Display, who are very prevalent in the desktop monitor panel market and are responsible for producing the majority of IPS panels which are increasingly popular and widely used. LG.Display (LGD) first declared its ambition to command the global 3D market at the Launching Ceremony for FPR 3D, held on December 9 at the Paju plant in Korea. With 45 participants related to the FPR 3D project including president & CEO, Young Soo Kwon, the ceremony was held to reconfirm the ambitious goal of LGD to become No.1 in 3D and inspire determination to accomplish the goal no matter what. The first FPR display was then unveiled by LG.Display on December 15th 2010 in Beijing, which included demonstrations comparing their new FPR technology against the more established shutter glasses (SG) technology. FPR is also sometimes called "space division switching" or "passive polarization" due to the method in which it delivers 3D content to the end user. A FPR display sends left/right images at the same time, and then separates the left/right signals through a patterned retarder film that is attached to the panel. The polarizing glasses that the viewer wears deliver these images to the corresponding eye. The passive polarization will deliver half of the horizontal lines (vertical resolution) per eye, meaning 1920 × 540 pixels per eye. This is often viewed as an issue with FPR methods which we will discuss later on in this article. Unlike SG methods which require 120Hz input signals to work (in order to deliver 60Hz per eye), an FPR display will only operate at 60Hz and does not give 120Hz support. Consumers need to be wary that "3D support" does not necessarily give you 120Hz input support, which some people are looking for in order to give them higher refresh rates and frame rates from their screens for regular 2D content. Here we will discuss the various features and selling points of FPR as a 3D technology. Keep in mind much of this content is based on LG.Display's perception of their technology. Since existing SG type displays use glasses that alternately open and close the right/left lens, flickering can be a serious problem. This can lead to headaches, dizziness or eye fatigue if it is viewed for long periods of time. However, the FPR type realizes a ‘comfortable-to-eye 3D image’ without flicker. The glasses are not actively shutting the lenses in any way and so this flicker is eliminated. The FPR displays a bright three-dimensional image by allowing sufficient amounts of light to pass through the open glasses. On the other hand, SG type TVs use liquid crystal lenses for their glasses that allow poor light penetration, it displays a much darker image than FPR generally. Recent improvements have been made to active shutter glasses as discussed earlier in this article. The higher brightness of FPR is still used as a reported benefit of this 3D method. Active shutter glasses are expensive to buy as they are fairly complex in their production and operation. They are also somewhat inconvenient to use as their lithium batteries have to be regularly charged and result in heavy frames. They are also not really suitable for people who where prescription glasses as they must be worn over the top. On the other hand, FPR type glasses do not need batteries and allow viewers with prescription glasses to watch 3D TV comfortably by wearing a clip-on version of the glasses. At the unveiling of the first FPR display in Dec 2010, audiences familiar with heavy and bulky SG system glasses were reportedly particularly impressed with the light and comfortable polarizer 3D glasses after trying them. You can even watch Passive 3D TVs at home with the same 3D glasses used in most cinemas (hence LG's 'Cinema 3D' branding). One brand's passive glasses will work with another's and they are thankfully interchangeable. The core technology for a 3D display is ‘How accurately it can deliver left/right images to each eye to realize a vivid and clear image’. Due to complicated signal processing and shutter movement, SG type TVs cause screen overlapping (crosstalk) where the image intended for the opposite eye leaks in. Since FPR type TVs separate the left/right images more clearly, they are designed to realize a crisper and clearer three dimensional image. Some modern FPR type TVs operate at 240Hz in either 2D or 3D mode using interpolation refresh rates and backlight scanning techniques. This can help reduce perceived motion blur. On the other hand, in SG types the left/right images are delivered through time division in 3D mode from a 120hz input refresh rate. This is split to 60Hz per eye which could cause image dragging in fast and dynamic images since only 60 frames of a 3D images are delivered per second. Keep in mind though that in the desktop monitor market, screens using passive 3D technologies only operate with a 60Hz input frequency and at the moment do not offer interpolated higher refresh rates like some LCD TV's do. A 3D screen using SG methods would offer a 120Hz input, split then to 60Hz per eye in 3D mode. As already explained, the support of 120Hz is considered a positive in SG method screens since it has benefits in 2D applications as well. One of the regularly cited 'limitations' of passive 3D methods like this is its supposed lack of support for true HD content. FPR technology, adopting space-division, displays both the left and right eye image at the same time by using lines of resolution. Of the 1,080 lines of resolution that make up Full HD (1920 x 1080), the left eye sees the odd lines while the right eye sees the even ones. This leads to the conclusion that only 1920 x 540 is being seen by each eye which is strictly correct. However this is sometimes wrongly interpreted to mean that an FPR display cannot display full 1080p resolution content. In the end, the viewer can see the Full HD image when the left image is combined with the right image, albeit with each eye seeing half lines of resolution. SG on the other hand delivers the full 1920 x 1080 resolution to each eye, but keep in mind this alternates between the right and left eye and only one eye is receiving the actual image at once. So in reality LG argue that one eye sees the 1920 x 1080 resolution while the other sees a zero resolution. At the end of the day FPR and SG are only different in format, and thus it is logically wrong to say that FPR cannot deliver Full HD picture quality. LG.Display are keen to re-emphasise these points through their newsletters and marketing. To support this further recently the vDE Association for Electrical, Electronic and Information Technologies e.v., one of Europe’s largest technical-scientific associations, verified through a strictly impartial picture quality analysis that FPR 3D TV displays full HD (1080p) resolution in 3D mode taking both eyes into account. Similarly in February, China Electronics Standard Institute announced that FPR 3D TVs meet full HD standards for both horizontal and vertical resolutions. For FPR to work, a special film is applied to the front of the display which produces the 3D effect. The passive glasses filter the image so that the resolution is being split in affect vertically in two portions. The black bars which break the horizontal and vertical stripes on the passive filter can sometimes create visible stepping effects in an image and cause it to look jagged or appear interlaced. Indeed, the reduced horizontal resolution of the Passive 3D system has a screen texture that looks remarkably similar to older cathode ray tube TV sets. SG is often considered to offer a sharper image as a result, most notable on curving and diagonal edges. FPR is an advanced "new generation 3D technology" according to LG.Display since the 3D effect is created through the screen itself as opposed to through the glasses. Glasses are still used of course, but the screen is creating the 3D effect. This will later lead on to non-glasses 3D screens with panel technology producing the 3D effect. Q. SG technology can deliver Full HD picture quality, but FPR cannot? A. The basic 3D technology is to make use of the binocular disparity caused by the distance between the left and right eye (6.5 centimetres on average). That is to say, a stereoscopic image can be created when a separate image is seen by the left and right eye sequentially. For this 3D effect, glasses with SG technology, adopting time-division, ceaselessly alternates the left and right image by blanking out one eye after the other rapidly. In other words, one eye sees the image while the other eye sees nothing, and thus, one eye sees the Full HD image while the other eye sees zero-resolution. on the other hand, FPR technology, adopting space-division, displays both the left and right eye image at the same time by using lines of resolution. Of the 1,080 lines of resolution that make up Full HD (1,920 x 1,080), the left eye sees the odd lines while the right eye sees the even ones. This leads to the conclusion that only 1920 x 540 is being seen by each eye which is strictly correct. However this is sometimes wrongly interpreted to mean that an FPR display cannot display full 1080p resolution content. However, in the end, the viewer can see the Full HD image when the left image is combined with the right image, albeit with each eye seeing half lines of resolution. Therefore, FPR and SG are only different in format, and thus it is logically wrong to say that FPR cannot deliver Full HD picture quality. Q. SG panels deliver high brightness while PR ones deliver lower brightness? A. This argument has a problem because it is based on the premise that viewers only watch 2D on a 3D TV. 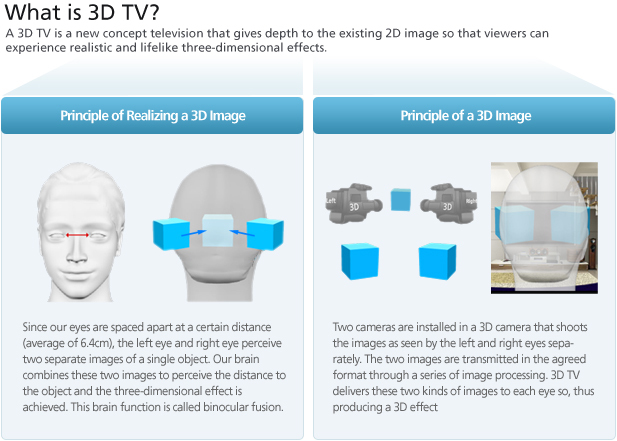 However, 3D TVs mean TV sets, on which viewers can watch both 2D and 3D, and thus it is right to consider both cases. FPR uses extra film instead of glass substrate attached to the LCD TV panel to deliver the 3D effect. Therefore, in consideration of the 2D environment, the LED backlight system was enhanced to adjust brightness. As for a finished product, FPR panels can deliver the same brightness as SG type ones in the 2D environment. On the other hand, SG technology delivers the 3D effect by using shuttering eyewear instead of LCD panels. Therefore, in consideration of the 3D environment, SG type panels’ backlight system was enhanced to adjust brightness. Unless brightness is not adjusted in such a way, SG type panels deliver much more reduced brightness than PR type ones in the 3D environment. As a result, both panels needed to enhance the backlight system to some extent. However, it is quite noteworthy that, in terms of the cost, FPR is much more competitive than SG because FPR glasses are at maximum ten times less expensive than SG ones. Q. FPR 3D TV’s vertical viewing angle is just 10 degrees (up/down), so it is hard to maintain the 3D effect? A. 42” or 47” FPR 3D panels’ viewing angles (up/down) may vary according to speculation, but currently, they are approximately 25~30 degrees. Therefore, in the general 3D environment or when watching TV at a distance of more than 1.5 meters from the display, viewers can enjoy the 3D effect. As for TVs ranging from 40” to 49”, ergonomically speaking, viewers can see a clear image without any crosstalk at a distance of more than 1.5 ~ 3 meters. Many ophthalmologists also warn that it is harmful to the eyes when watching TV at a distance of less than 1 meter. Moreover, when watching TV at too close a distance, viewers have no choice but to see a blurry image because the partial image on the screen is out of focus. 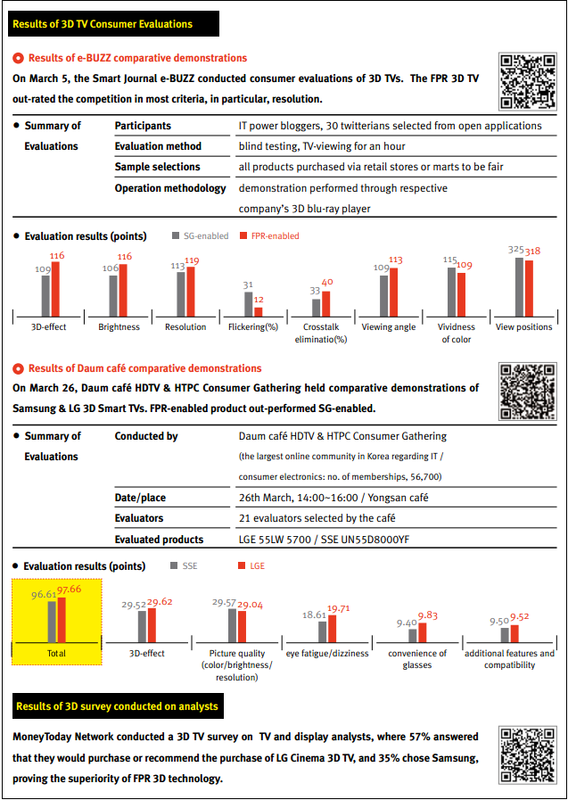 On March 10, LG Twin Towers heated up with the fervour of some 120 reporters who came to cover LGD’s CEO press conference on “proving the superiority of FPR 3D technology.” Two days before the conference, a competing company had made groundless claims that FPR was inferior to that of their own—sparking up the controversy over the superiority of current 3D TV technologies—and the press were eager to find out how LGD would respond. President and CEO Young Soo Kwon began the conference by saying, “I would like to apologize to the consumers for having let the recent war of words between LG and Samsung go slightly out of hand,” and added, “We have therefore prepared this conference with the purpose of putting an end to the confusion as early as possible.” He went on to show respects to the competing company in a most sophisticated manner by saying that the competing company’s president was an admirable entrepreneur and he thought very highly of the company—who had been a friendly rival for a long time. However, he was resolute in his words when saying that he requested they refrain in the future from creating anymore slander advertising or holding unproductive and unnecessary debates. President and CEO Young Soo Kwon personally led the conference from the beginning by asserting that if SG (Shutter Glasses) technology is the first generation 3D technology, FPR is the technology of the next generation. Next in line came clear and organized refutes to the claims of the competing company, parading the advantages of FPR 3D. The first issue, and the biggest, was about providing full-HD images. President Kwon showed unwavering confidence on the matter, saying that FPR 3D TV’s capability in providing full-HD 3D images has already been validated by world-renowned certification bodies such as Intertek and China Electronics Standards Institute, and they will also receive such validation from all other authorities in the future. He went on to introduce the results of a “3D TV consumer evaluation,” conducted by an online media with IT power bloggers and some thirty twitterians participating, and revealed that FPR out-rated the competing technology in numerous aspects including 3D effects, flickering, resolution, and brightness. He also proposed to the competing company, which had abruptly refused to participate in the comparative demonstrations of the products promoted by the Korea Communication Commission and Daum Café, that they both participate and see who comes out on top. In addition, Kwon commented on the so-called “monkey advertisement,” published by the competing company, and made his position clear by saying that he hopes there will be no more slander advertising. The issue about crosstalk and flicker were also raised. President Kwon said that these two issues were the main causes of headaches, dizziness, and eye fatigue, giving examples of the recommended 3D TV viewing-time, announced by the Japanese 3D consortium and Korea Communications Commission. He then revealed that many world-renowned authorities had announced SG products to be potentially harmful to the body because of flickering, adding that FPR 3D has already been validated as flicker-free by TÜV whereas SG 3D had failed to do so. In addition, he disclosed the information regarding crosstalk, where FPR (0.6%) was far more superior to that of SG (2.6~6.8%). At the conference, LGD had prepared a booth for actual demonstrations in order to help the press understand the difference better. Two different environments of natural light and night setting were created, and the company compared LG Electronics’ FPR 3D TV with the competing company’s latest SG 3D TV. The LG product displayed smooth 3D images even under fluorescent lighting, whereas the competing company’s product showed flickering from the interference created by the lighting. Most of the press acknowledged LGD’s statement to be true. Last but not least was the viewing-angle issue. President Kwon introduced the results of a study, conducted in Japan, on reasonable TV viewing-angles. He emphasized the fact that FPR 3D TVs, which uses the IPS technology, display clear 3D images anywhere within the reasonable TV viewing-angle, whereas SG products start displaying dark images when the viewer tilts their heads to the side and nothing can be seen when the viewer lies down. 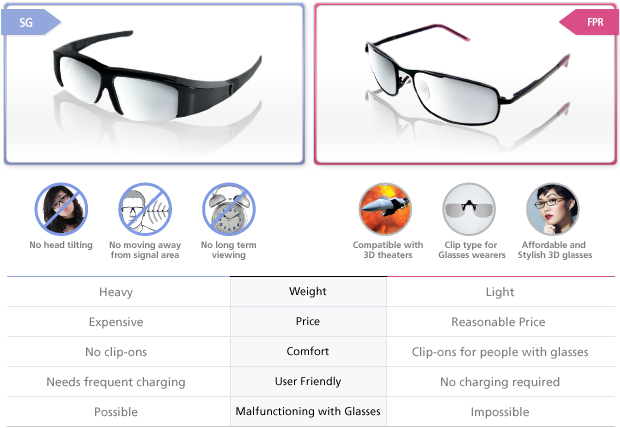 In addition, he stated that the glasses used in SG technology make it unsuitable for many people to watch at the same time as it shows various problems, including weight, electromagnetic waves, eye fatigue, and inconvenience of use, while FPR glasses, which are similar to that of ordinary glasses, possess various advantages such as cheaper price, compatibility, and convenience. Lastly, President Kwon said that 3D technology has evolved from the 1st generation of SG, where glasses played a big role, to the 2nd generation of FPR, which has minimized the role of glasses, and projected that ultimately, it will become glasses-free. However, he added that commercialization of glasses-free 3D will take some time, due to the problem related to resolution as well as the involved cost, and therefore, FPR is the real 3D technology that reflects the needs of consumers, the technology that will revolutionize the market. At the Q&A session, held after the speech, President Kwon revealed that five Chinese companies are currently manufacturing or have plans to manufacture TVs using FPR 3D panels, and world-renowned companies in the US, Europe, and Japan have also begun purchasing FPR panels. In addition, he said that he also expects more monitors to be produced using FPR 3D panels, and he is confident that LG Group’s FPR 3D will become the new standard of the 3D market. In the desktop 3D monitor market, NVIDIA are probably the biggest player. NVIDIA launched its 3D Vision technology back in January of 2009, giving consumer-level 3D gaming the biggest endorsement it had ever received. The past three years they have grown this technology into a central feature, exclusive to their GeForce graphics product line, and also further evolving into a triple-display capability they've dubbed "3D Vision Surround". Their own NVIDIA 3D Vision technology is incorporated by many manufacturers and by many displays. An NVIDIA 3D vision experience requires several elements as outlined above. You must have their proprietary active shutter glasses kit which comes with an IR sensor / emitter which connects to your PC. NVIDIA have created an end to end system for delivering 3D where the glasses are a big part and must be combined with 3D Vision certified displays and graphics cards. 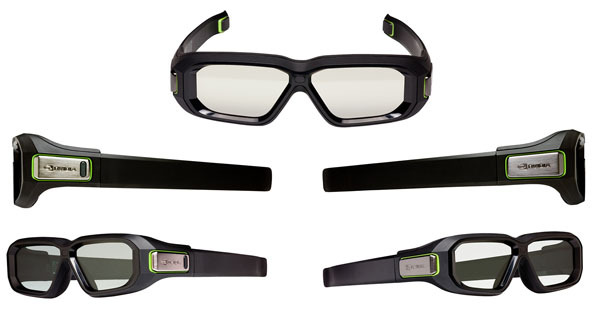 The glasses themselves are designed to work with 3D Vision monitors and notebooks, but NVIDIA IR emitters cannot be used with most SG supporting 3D LCD TV's or projectors. You must also have a 3D Vision ready display which supports 120Hz refresh rates. You also need a compatible graphics card and PC set-up, and of course relevant 3D content and (in-house supplied) drivers to display the stereo 3D images. The graphics cards from NVIDIA's range commonly have a dual-link DVI output to be able to handle the full 1920 x 1080 resolution at 120Hz. As a result your display must feature DL-DVI to be able to use NVIDIA's solution at its full potential. A list of compatible displays, notebook PC's, TV's, projectors and graphics cards can be found on NVIDIA's website (although not exhaustive). When you’re looking to build a 3D-capable gaming system, NVIDIA's approach is considered simpler than the AMD HD3D option because you're only looking for one proprietary certification, 3D Vision. You can also use multiple cards in SLI to boost performance, and that's a nice option to have since stereoscopic 3D effectively halves frame rates, often demanding more potent graphics hardware for your favourite games. The Samsung 2233RZ, BenQ XL2410T and more recently the BenQ XL2420T are three displays we have tested which are compatible with NVIDIA's 3D Vision technology. Some screens will come bundled with the NVIDIA 3D vision kit (glasses and sensor) and some would require you to source them separately. The Asus VG278H is a 27” model with a built-in 3D Vision 2 emitter and a bundled pair of new glasses. NVIDIA also lists the Acer HN274HB and BenQ XL2420T / XL2420TX as 3D Vision 2-certified monitors which are new to the market or being released very soon. AMD's HD3D system is another alternative method for delivering 3D content in the desktop monitor market. AMD arrived in the 3D market a little later than NVIDIA in October 2010 and have adopted a slightly different approach. Unlike NVIDIA and instead of a proprietary system, AMD provides driver hooks to software developers and leaves 3D displays and glasses to third-party providers. Their graphics cards can be used with passive polarized 3D display and 120Hz active shutter display types alike. There is no glasses or monitor standard whatsoever. They do not manufacturer their own glasses, have removed the need for USB IR emitters and rely on 3rd party middleware for existing games. Because of its more open environment, we've had to wait a lot longer for HD3D to become a viable angle. After all, other companies had to provide all of the hardware and software to support it. Obviously the main component here is the AMD graphics card which must be capable of supporting 3D content. From there you will need a compatible display, whether that's a desktop monitor, an LCD TV or a projector. For a desktop monitor you should have a DisplayPort connection ideally, as AMD have widely opted to use this as their high bandwidth interface instead of Dual-link DVI. This will allow you to use a full 1080HD (1920 x 1080) resolution at 120Hz as the bandwidth of DisplayPort can support that. Some desktop monitors have aligned themselves with either AMD or NVIDIA through their choice of either DisplayPort or DL-DVI really, so keep that in mind when selecting a screen. For an LCD TV or projector where DisplayPort is not offered you will need to have HDMI 1.4a available. However, due to bandwidth limitations you are only able to use this at 720 HD resolutions (1280 x 720) at 120Hz (i.e. 60 frames per eye). At a full 1080 HD resolution you are limited to 24 frames per eye. As DisplayPort becomes more popular in desktop monitors and other screens this limitation will be overcome and high bandwidths will be supported more easily. If you have an AMD graphics card which supports their HD3D technology you must also purchase a piece of middleware which accesses AMD's quad buffer graphics drivers and allows you to convert regular 2D games to stereo 3D. These are provided by third parties TriDef DDD and iZ3D and a discount is provided for their software if you have bought an AMD graphics card. This additional software retails for around $20 - 25 so it's important to keep that in mind when looking at an AMD based system. Native support of stereo 3D content will also be included in some future games and this would mean images will be rendered to the left and right eyes separately. This will also tap into their quad buffer without the need for the additional middleware. Due to its complexity native 3D support is unlikely to be widely implemented at this stage and so the middleware remains a key component to their delivery of 3D content. There doesn’t seem to be an official TriDef or iZ3D game certification, so you’ll have to do a little research using reviews to find out which games work and how well. AMD Radeon cards cannot yet be used in CrossFire to boost stereoscopic 3D performance either. AMD are also working with major ISVs like Roxio to enable Blu-Ray 3D playback through their technology and are working with various glasses manufacturers as well. They feel that there should be industry standards for stereo 3D support and want interoperability between different products from different manufacturers. They are also incorporating 3D support via DisplayPort interfaces as well as HDMI 1.4a. A list of supported hardware including graphics cards and monitors is provided by AMD on their website. Recent monitor releases including the Samsung 750 and 950 series feature AMD compatible 120Hz SG technology and a DisplayPort interface suitable for use with HD3D at full resolution. Another aspect of 3D content is of course movies. We have looked already at the various methods of displaying 3D stereoscopic content and the technology involved. Obviously there are a wide range of ways you can gave in 3D, whether you convert traditional 2D content or play games supporting native 3D modes. The other popular use of 3D is in movies, where it is already becoming far more common in cinemas and now also in the home. To support 3D content, the Blu-ray file format is now commonly used, although you will also find various pieces of 3D content in other formats online, or in downloadable format. These are often very large in file size which is why the storage capacity of Blu-ray is ideal for delivering 3D movies and content. On December 17, 2009, the BDA officially announced 3D specs for Blu-ray Disc, allowing backward compatibility with current 2D Blu-ray players. The BDA has said, "The Blu-ray 3D specification calls for encoding 3D video using the "Stereo High" profile defined by Multiview Video Coding (MVC), an extension to the ITU-T H.264 Advanced Video Coding (AVC) codec currently supported by all Blu-ray Disc players. MPEG4-MVC compresses both left and right eye views with a typical 50% overhead compared to equivalent 2D content, and can provide full 1080p resolution backward compatibility with current 2D Blu-ray Disc players." This means the MVC (3D) stream is backward compatible with H.264/AVC (2D) stream, allowing older 2D devices and software to decode stereoscopic video streams, ignoring additional information for the second view. So in simple terms, you can play 3D Blu-ray discs on older players in 2D mode, and if you have a 3D Blu-ray player, you can make use of the extra dimension and play the content in full 3D. Since their games console also features a Blu-ray drive, Sony has released a firmware upgrade for PlayStation 3 that enables 3D Blu-ray Disc playback. They had previously released support for 3D gaming on April 21, 2010 (followed by the availability of 3D movies). In addition, the smoothest stereoscopic experience on the PC right now is Blu-ray 3D playback, which functions almost identically, regardless of whether you're using a Radeon, GeForce, or even HD Graphics engine able to accelerate the feature in hardware. Arcsoft, Cyberlink, and Corel all sell Blu-ray 3D playback software that don't require any middleware; it just works right out of the box with very little hassle. Various tests across the web have found the experience pretty simple and consistent, no matter what graphics card you use. When considering the viewing of 3D Blu-rays from any device, whether that be a PC, games console of dedicated player, you need to again think about the interface options available and the associated limitations on bandwidth. Looking briefly now specifically at desktop displays, I wanted to touch on the current associations between support of 3D content and panel technologies. When 3D support first started to appear in the mainstream desktop monitor market (ignoring older pro / specialist screens), it was exclusively linked to TN Film panels. Initially the main method for delivering 3D was using SG methods and active glasses and even now, all of the current desktop monitors with SG technology are based on TN Film panels. There has been a significant development from panel manufacturers in this regard, working to develop their TN Film modules to offer support of SG 3D and also of the all-important 120Hz refresh rate. Most of the main panel manufacturers now offer 120Hz compatible modules based on TN Film technology. As a result you will see many models in the market using TN Film and offering 3D /120Hz support. This has also been done to help keep costs down, and also tap in to the inherent responsiveness of TN Film technology, since the primary use of many of these screens is gaming. TN Film has been exclusively linked with SG active 3D methods at the moment, and no passive alternatives. LG.Display as we have discussed are not backing SG methods for 3D delivery, and are instead investing heavily in FPR and passive 3D methods. As such, we have not seen any IPS panels (LG.Display manufacturer nearly all the IPS panels in the market) which will support 120Hz refresh rates needed for SG 3D. Instead, we have started to see some IPS panels emerge with FPR support, and so IPS does offer 3D support, just not using 120Hz refresh rates and SG. Uptake of these panels by monitor manufacturers has only been quite recent but we are starting to see more IPS + 3D models emerge. It is unlikely that LG.Display would also develop a 120Hz compatible IPS panel (for SG methods) but I would not rule it out completely. 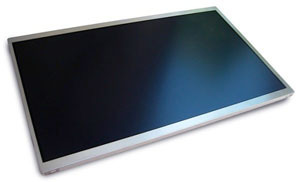 AU Optronics have recently started to produce their AMVA panels with support of 120Hz though, meaning that at some point we will start to see monitors emerge using AMVA and offering 120Hz and 3D support using SG. At the time of writing they are manufacturing 24" and 27" modules in this way which will be a welcome alternative to the mass of TN Film panels we already have. From our recent tests of AMVA panels, the pixel responsiveness is not particularly impressive however, so it will be interesting to see if AUO can improve on this if the new panels are to be used for fast gaming. At this time AUO are not looking to use passive 3D methods. Samsung are the other panel manufacturer who currently supply common alternatives to the technologies already mentioned. They manufacturer and produce their own PVA and new PLS technologies. The latter is very recent and has only been used in a couple of monitors so far such as the Samsung S27A850D. This was designed as an alternative to LG.Display's IPS and so if successful we would expect it to perhaps become their primary alternative technology (other than TN Film). At the moment we have not heard of any plans to combine PVA or PLS with 3D methods, although I suspect a 3D PLS panel may emerge at some point in the future. It remains to be seen whether that would use SG or passive methods, but given Samsung's direction in the LCD TV market I would expect it to be an active method. I have provided a summary of this section in the table below. No passive alternatives, high 120Hz refresh rate, questions around panel responsiveness. Unclear at this stage whether PVA will be used with 3D methods.